Maid cafes are a staple for the geeks in Japan. They might go to Akiba on any given weekend to support aspiring idol singers, pick up a mech model or manga, and have coffee served to them by cute cosplaying maids at a cafe. These maid cafes are very popular there and are getting more mainstream - enough to spread to different countries around the world. Including ours. 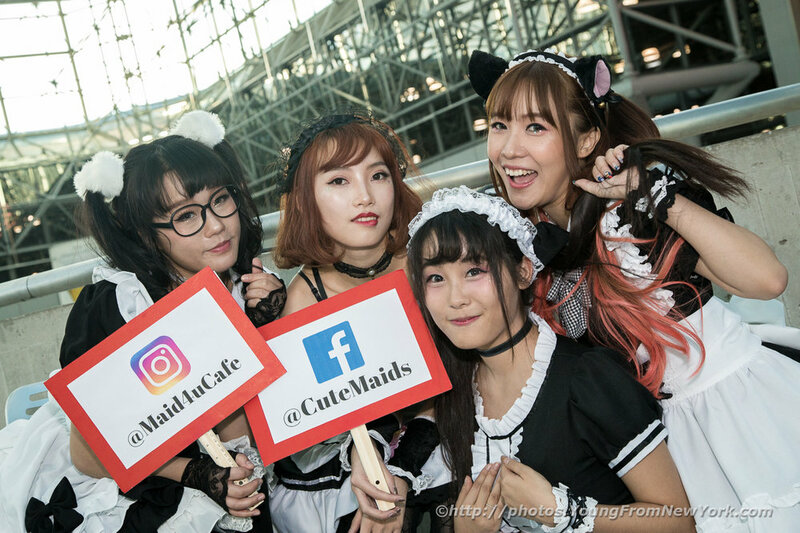 Maid4U is an offshoot of the maid cafe idea and is based in New York city. But instead of the usual retail coffee shop, they've modified their services to cater for events - from black tie events and grand openings to conventions and shop promos. So the next time you have an event that could use a few maids to serve and entertain, Maid 4 U may be an interesting option. Maid Akina (the princess) - has a princess complex, and is perhaps, a bit arrogant - the ultimate idol maid. She walks the talk when it comes to talent, especially in dancing (pole, in particular). Maid Senna (the baby) - she's got the sweetest personality (mostly)... until her split personality catches everyone by surprise. Happens more often when the other maids poke fun and irritate her. Maid Miyu (the prankster) - She's impatient and spoiled, but likes treating all her masters like her big brothers. She loves pulling pranks to get attention. Maid Kokoro (shy and clumsy) - She's the timid one of the group, and the other maids do their best to protect her (sometimes from herself!) She'll fall 100 times a day and can be forgetful. Unlike a typical maid cafe, they don't just walk around looking pretty - they're delightful to watch as they interact with each other. It's somehow like having a maid reality show in the midst of your event with your guests being a part of the show. Part of the fun might include a break out in a sudden group song and dance or an ad hoc magic trick. It's a great deal more fun for guests than simply being greeted and seated. And that's just the short list. If you own a bakery for instance, you could even hire Maid 4 U and make an event out of a slow day to draw in new customers. Advertise, promote and offer some entertainment with a lovely group of quirky - but talented ladies. Oh, and they travel too, if you're outside of New York City. For those of you interested in seeing Maid 4 U in action, their next public appearance will be a Valentine's special on February 13th, 2018 from 6pm-11pm (Kulu Desserts in Flushing, Queens. They will be wearing school girl uniforms and competing for your attention. Details are available on their facebook page.